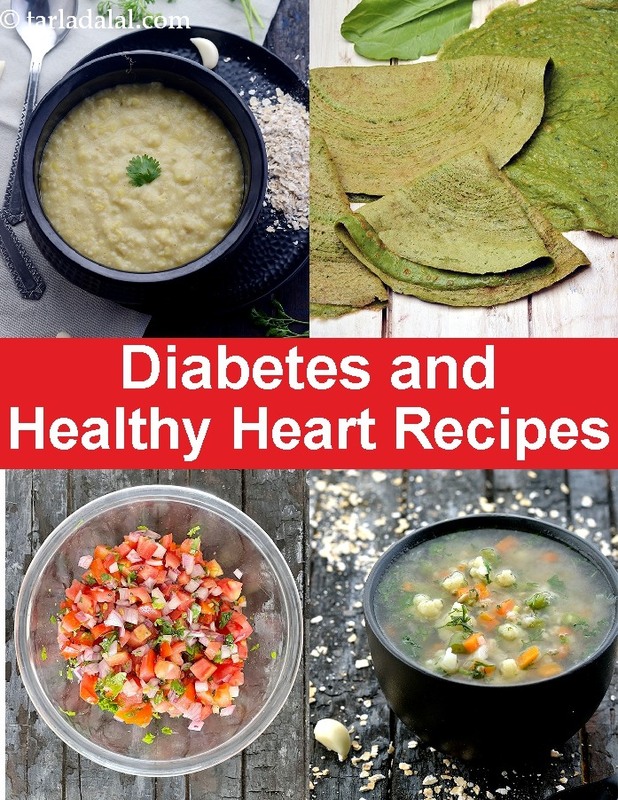 diabetic and healthy heart recipes. We present you a whole range of recipes which are diabetic and heart friendly. We have taken into account The Indian diet and recommended healthy Indian recipes for diabetics with a heart problem. Why diabetes and heart issues are related? The presence of diabetes over time increases the chances of developing heart disease and have a greater chance of stroke too. The high blood sugar levels damage the blood vessels and the nerves that control the heart. It is said that adults with diabetes have twice the chance of developing heart disease. A healthy diabetic-friendly diet can help you manage diabetes and lower the chances of heart disease or stroke. If you are a diabetic and already have an existing heart problem, then too you need to pay equal attention to what you eat. • Right amount of carbohydrate in each meal. • Loads of fiber by consuming a variety of fruits and veggies. However banana, chickoo, custard apple, mango, watermelon, potato, yam, purple yam etc. should be avoided. • Limited amounts of protein. • Whole grains like oats, jowar, nachni, whole wheat flour, quinoa, barley should be a must daily. • Restricted quantity of salt. • Include omega-3 by way of fish oil, walnuts, sunflower seeds etc. • Not more than 3 teaspoons of oil per day. Aim at healthy fat like olive oil over trans fats and saturated fats. Try recipes like Onion Thyme Soup, Sprouts Tikki and Whole Wheat Salad Hummus Wrap to take a step ahead towards keeping your heart healthy and managing blood sugar levels.